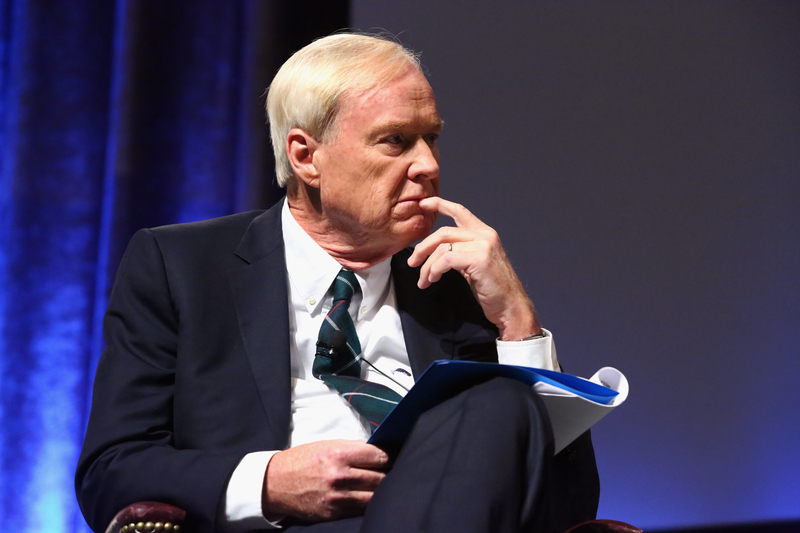 Like Donald Trump, MSNBC host Chris Matthews has a pesky habit of compulsively commenting on women and their appearances. Although he and Trump have gone head-to-head on abortion, the two share a record of objectifying women. Remember when Trump made it clear why he thought Carly Fiorina couldn’t be president — “look at that face!" — and then attempted to overcorrect by saying she was beautiful? That’s important because in a way, calling her beautiful is no better — it still puts a premium on her appearance, as though that’s a qualification of hers that matters. Some people just can’t help themselves from commenting — and like Trump, Matthews is one of them. The latest pearl on Matthew’s long stream of objectification is Trump’s own wife. On Wednesday, Matthews treated us to an extended on-air admiration of Melania Trump’s “runway walk,” made when he (for whatever reason) believed that his microphone at that moment was merely decorative. Everyone around him was still speaking, so the fact that he thought his ogling wasn’t being broadcast live is pretty baffling, but I guess we all get complacent from time to time. It was uncomfortable, to say the least. “We will go to a break here,” interjected an also-mic'd and admirably even-toned Brian Williams, valiantly trying to maintain order. Bustle reached out to Matthews' representative for comment, but had not heard back by the time of publication. This was interspersed with a lot of technically innocuous but still rather loaded language about how she “could not be hotter as a candidate” and whom she might “kiss” with her endorsement. He’s gushed in similar fashion about CNN anchor Erin Burnett. Matthews has also called Democratic front-runner Hillary Clinton “Nurse Ratched” and “witchy." Even his remarks that haven’t directly addressed her appearance are still at times rife with sexism. Matthews has also implied Clinton is where she is because her husband cheated, and so forth. So, where does this latest objectification-fest fall on the spectrum of Matthews’ comments over his decades of speaking in the public eye? I still firmly believe that it’s no better to be admiring a woman’s appearance than disparaging it. As long as we are still, in fact, talking politics, a woman's appearance has no reason to be something people judge her on, one way or the other. But I do think it’s important to consider whether or not it matters that Matthews believed he was speaking privately. When he went on and on about Palin, he was doing so in full awareness of his position on a national stage in front of a working microphone. The fact that he, apparently, believed himself off-air when he salivated over Melania Trump’s walk was immensely stupid, and in no way excuses or detracts from this pattern of behavior, but, as much as it pains me, I am inclined to downgrade the level of importance we ascribe to this. I believe there’s a difference in the level of accountability we hold someone to when it’s their (theoretically) off-duty, private-ish thoughts versus something they intend to defend as a part of their public opinion. Again, I am not happy about this, but I don’t think this is as inexcusable as, say, the Palin stuff. In the greater scheme of things, Matthews needs a reminder that women’s appearances are not the first nor the only metric of their worth, but in this particular case, the guy mostly needs a reminder to watch out for hot mics.